I am building my empire. I am the master of my destiny. 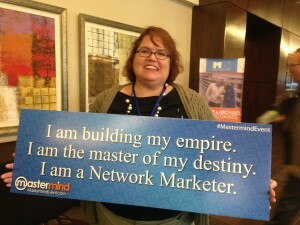 I am a network marketer. 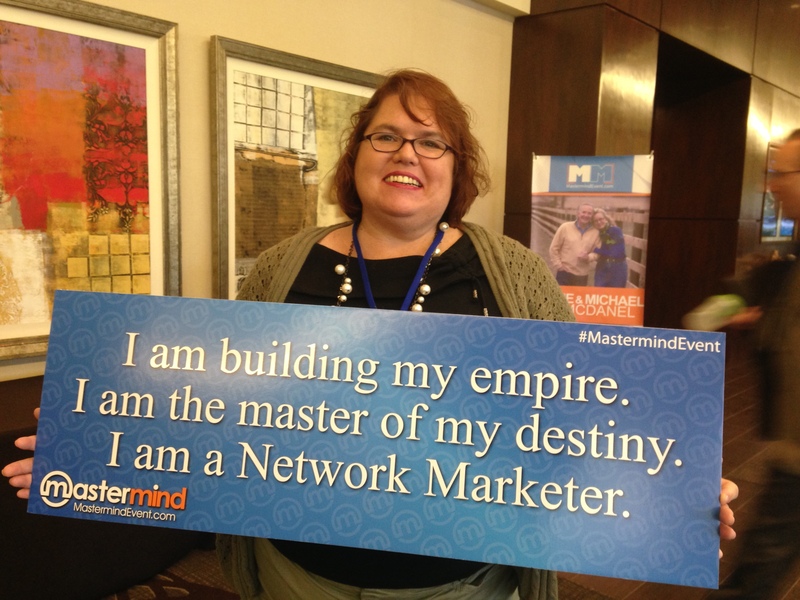 I loved that sign at a recent Mastermind network marketing training event held in Orlando, Florida that had thousands of network marketing promoters from all kinds of business doing extremely well and earning significantly more than they ever could in the corporate world. Network Marketing had a bad rap in the the 1980’s and 1990’s but things are changing. With the flexibility of working from home because of wireless internet and online conferencing for conference calls it is much easier to work globally as I do in my home office in Punta Gorda, Florida. The majority of people also understand that CEO’s and high ranking corporate executives make the majority of the income in a traditional business leaving an average salary of $30,000 or less for the average office worker. (2006 figures) Network marketing changes that making it possible for anyone who works hard and has a desire to succeed to be successful regardless what credentials, high school diploma or higher education degrees they have. ability to earn whatever level of income I want. Some are happy with working part-time and earning an extra $500 a month, some prefer $10,000 a month and some prefer more. I know people in my Beyond the healthy chocolate company business that are multi-millionaires, millionaires and individuals that earn double or more than what they earned in the corporate world. I am thankful that in my business we have amazing healthy chocolate products that you can’t find in stores. 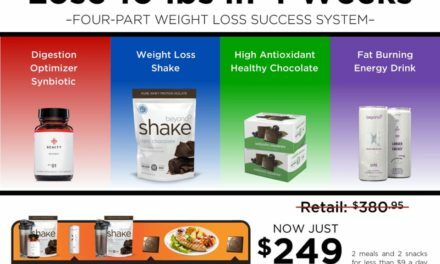 People love our chocolates and there are many testimonies and stories about how healthy chocolate has improved health including my own. Healthy chocolate is a gold mine as it has the highest antioxidants found in fruits and vegetables that I am aware of on the planet. Eating lots of antioxidants reduces inflammation. Inflammation causes disease. So it stands to reason that those who consume Beyond healthy chocolate regularly will continue to consume it because of the products. I fell in love with the products first and the business second. You can do it anyway you want. Contact Lynette Henk in SW Florida at 941-216-5727, email [email protected] or visit us at MyChocolateVitamins.com. Trust me, this is the business you want to be involved with in 2015. Don’t miss out! PreviousIs All Dark Chocolate The Same; Does It Matter If It Is Cold Pressed, Heated Or Dutched?